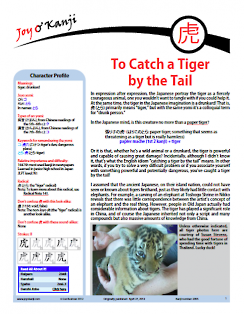 In the Japanese imagination, the tiger is both a fierce fighter and a drunkard! Through 虎, a new Joyo kanji, we encounter expressions about fighting, danger, courage, risks, and vigilance. We'll see which famous companies, musicians, and sports teams are named after this awe-inspiring animal, also finding out who wears tiger-striped underwear in Japan! Don't miss the fantastic photos of tigers in Thailand! Feb. 9, 2019: pp. 2, 3, 7, and 11: Fixed broken links. Feb. 7, 2014: Adjusted answer #5 on p. 6 in Answers to Quick Quiz 1. Oct. 31, 2013: Fixed some formatting and fixed the last link on p. 8; fixed the first link on p. 9, Sidebar 6. Sept. 19, 2012: Added 8 photos to pp. 14–16.